Prepare all your vegetables by cutting them into long thin sticks. Use a fork to whisk together all the ingredients for your satay sauce. Whisk until the mixture is smooth and well combined. Cook the vermicelli noodles according to the instructions on the packet. Cut your tofu into strips and fry with the sesame oil, garlic cloves and Tamari. Set aside to cool. Thoroughly wet a tea towel and lay it at on the bench, this is what you will prepare your rolls on. Fill a large bowl with hot water. Place one sheet of rice paper in the bowl, and leave it to soften for 10-20 seconds. Keep a close eye on it because it can go soft and tear quite easily if left in too long. Remove the rice paper from the bowl and lay it on the wet tea towel. 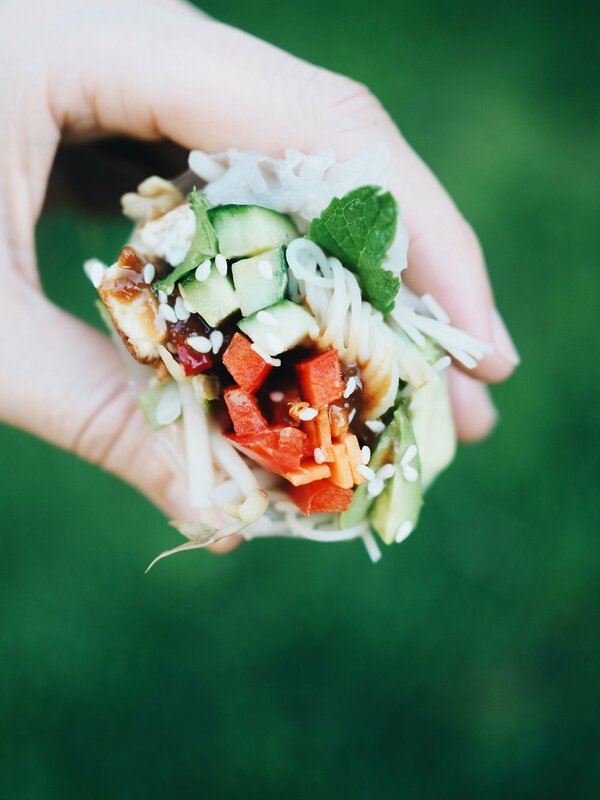 One at a time, place your fillings in a line towards the bottom of the wrap. Once all your fillings are in, fold the sides of the rice paper in, then roll the rice paper around the filling, a bit like rolling up a pancake. This is very hard to explain by text alone, so if that doesn’t make sense check out Youtube for plenty of demonstrations. Repeat with the remaining rice paper sheets until all your fillings are used up. Serve with a bowl of your satay sauce for dipping each roll into. Plant-based diets, low iron & what to do about it!